Friday, June 9, 1911: Must have forgotten what I did today. It won’t come into my head when I am ready to write it down. Since Grandma didn’t have much have much to say today, I’m going to go off on a tangent. When I look at photos from a hundred years ago some of the people look stout to me—well, frankly they look obese. We hear that people are more likely to be obese today than in the past—and I wondered what people considered a healthy weight to be a hundred years ago. Women should range in weight from one and eight-tenths to two and two-thirds pounds to each inch in height. In order to determine your own factor in this respect divide your weight in pounds by your height in inches. Any weight above two and one-half pounds to the inch in stature may be considered as excessive, inasmuch as it adds nothing to one’s mental or physical efficiency, and is frequently the forerunner to obesity. According to the book, in 1911 the average woman was 5 feet 4 inches tall and weighed 133 pounds. According the Center for Disease Control and Prevention website the average woman today is still 5 feet 4 inches tall, but now weighs 165 pounds. 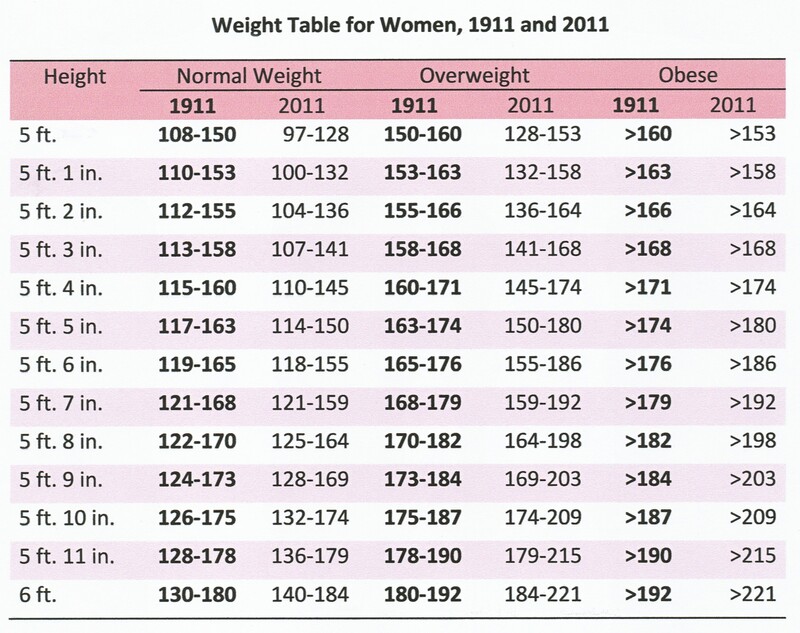 The chart above indicates when a woman was considered normal weight, overweight, and obese in 1911 and 2011. I was amazed to discover that according to the chart I’d be considered normal weight in 1911, but overweight today. Today a person’s body mass index (BMI) indicates whether they are a healthy weight. BMI is calculated based upon a person’s height and weight and is calculated using a formula that is more complex than the ones used in 1911. How fortunate you are to have those diary entries. Interesting how people had different perceptions of what a large person looked like years ago. I haven’t seen the Honeymooners in years. I’m going to have to look for a video of them the next time I’m at the library. Interesting. What a treasure to have someone’s writing from 100 years ago! Very enlightening: although proper weights were lower back then (no surprise there), we were not judged overweight and obese until higher weights than today. Makes me think we must be more judgmental today, and less willing to accept variation! Nonetheless, I think the prescribed weight ranges back then were probably healthier–pre-genetically modified wheat and junk food everywhere! I used to be skeletal-skinny. I finally gained the extra 20 pounds I longed for during my mid 40s. Except it didn’t all go where I planned. Now I’m thin with a ring of blubber around around my waist, and no one feels sorry for me because I was skinny for so long. Be careful what you wish for, or a least be more specific about your wish. People of your grandmother’s time ate about 5,000 calories a day…because they were physically in need of that much. The people didn’t have automatic diddly squat! They were seldom idle at all. Today we are raising couch potatoes and children who are plugged in around the clock. Playing outside is almost unseen. I marvelled over the fact as I drove through the neighborhood on Christmas Day and the few days after…there weren’t any children playing outdoors with new toys or bikes or skateboards. Zilch! Weird. Odd how much has changed in just 100 years. This chart is completely wrong. Woman are WAY bigger these days. Check medical records, and fashion sizing. A size 14 in 1952 is today’s size 8. I had to do a report on this. Women are definitely bigger today. I think the chart shows what women “should” weigh, not what they do weigh. Yes, the chart shows what experts thought women “should weigh” in each time period. wow we are getting tubby aren’t we…..rather alarming! I figured that the standards would have shifted. I was surprised that 5’4″ was the average height 100 years ago and still is today. I had thought people were getting a bit taller each generation. You might enjoy reading another post that I did on Average Height of Males and Females, 1912 and 2012. It uses different data sources from this post, but indicates that adult women were on average 63.75 inches tall in 1912 and 64.3 inches tall in 2012. Even though women were more than 1/2 inch taller in 2012, I guess that both could be rounded to 5′ 4″. 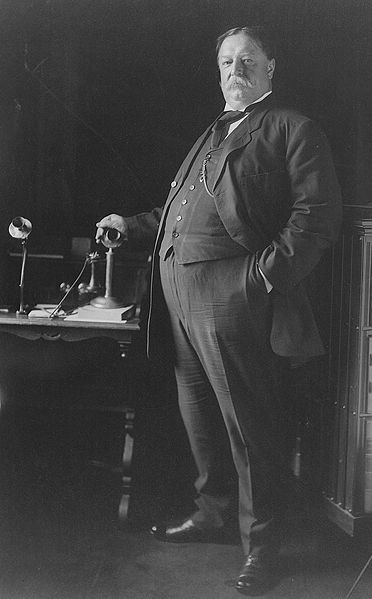 What knocks me out about this is that, as big a fatass as Taft objectively was, you can walk around any moderately sized city on any given day and see more than a dozen people who are bigger than he was. Regardless of their standards for “overweight”, if you look at actual BMI, you will see that it has increased dramatically over the last 100 years. For example, using West Point cadet data.